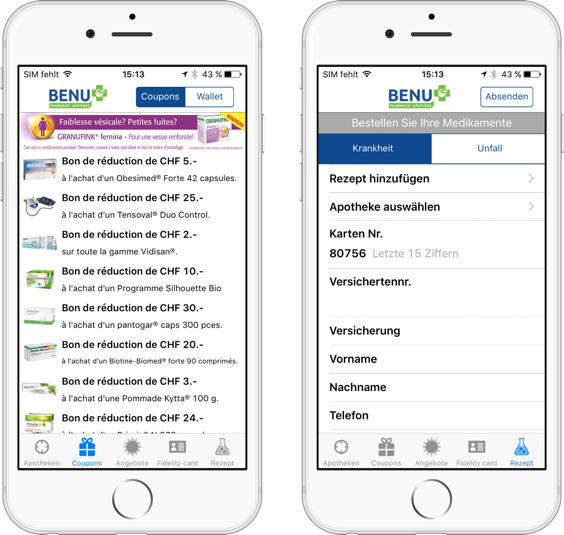 BENU wanted to make an app easier for their loyal customers to find the nearest pharmacy and provide them with all the information they need. The app had to be compatible with all iOS and Android devices. ClickOn developed an application for Android and IOS, so that as many users as possible could use the app. In order to help customers find the pharmacy, we have developed a geolocalization function to display the list of BENU pharmacies from the nearest to the most distant pharmacy. As product placement and discount were relatively classic, they did not pose a major challenge. Nevertheless, the home delivery of medicines in Switzerland had to develop a well thought-out process, as the advisory role of a pharmacist is necessary to obtain a prescription drug. Contact with the pharmacist could not be avoided. However, the recipe can be sent electronically. ClickOn developed an app that meets the requirements of BENU and the Swiss law. The customer sends the prescription with a photo to the nearest BENU pharmacy. The customer enters his personal data and security number. The pharmacist of the nearest pharmacy is notified by an automatically generated call. The pharmacist contacts the customer and gives a consultancy for him/her and arrange delivery or collection. Depending on the customer’s choice, the customer receives the prescribed medication.